Ever wondered why top sailors choose the pin end on a neutral starting line risking to breach Rule 10?! The picture below shows how ”aligned boats” react as a wall or an obstacle to the wind. In fact, when the wind hits an obstacle it diverts and accelerates which means that the guys at the pin end will have a lift and an acceleration (a boost after the start), but the guys at the committee boat will have a header (so it’s best to tack straight away). The choice is linked to the fact that sailors at the far end can bear away to plane their boat and get away from the pack early. A line sag is the bow we see in the middle of the line during the start procedure. While in the middle of the line, most of the sailors lose eye contact with both ends of the line and prefer to hide than to risk showing up and have an UFD on their score board. Use this common mistake to your advantage by moving forward and trying to see both ends of the line. You will certainly be rewarded every time by discovering that the ten boats above and beyond you have a minimum of one boat length or more below the line. The picture below represents the gold fleet at the 2016 Laser Worlds, the top 50 sailors in the world, and we keep seeing the bow in the middle of the line. 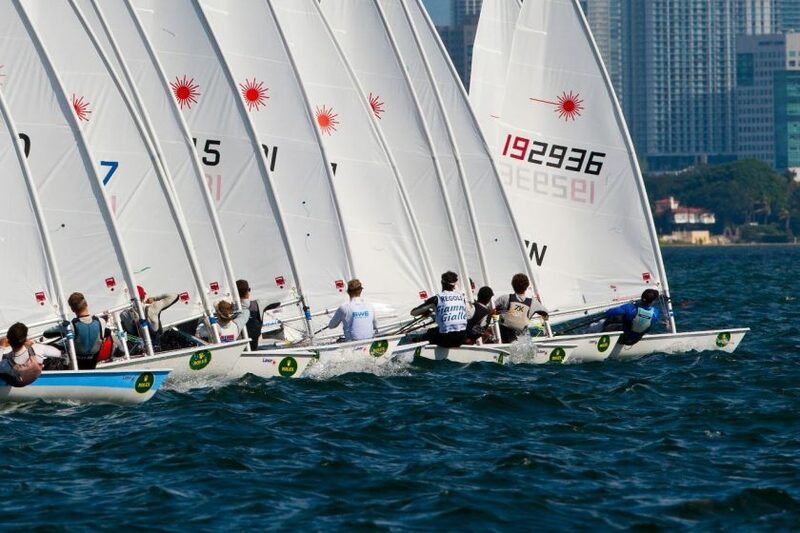 At the Olympics and in World Cup gold fleets, sailors start positioning on the line as early as minute 4! In this case, practicing your positioning maneuvers is essential to protect your spot until the start signal. Start half a boat length in front of boats to windward and leeward. In a big fleet, start half a boat length from the boat on windward and leeward to have clear air and water flow, but be smart enough not to get an OCS and be covered. If you are lucky enough to sail close to the shore, you have the opportunity to know exactly if you are on the line or not. Try to be on the far end of the line looking in the shore’s direction. How to find a mark onshore: align yourself with the committee boat and the pin end. The intersection between the starting line and the shore will be your mark onshore (building, mountain top…), now you are able to know exactly where the line is even in the middle of it. A powerful sail is physically demanding, yes, but it is the insurance of a fast acceleration in case of hitting a bad wave. Your decisions during the first minutes of the start will determine how your race will be. Keeping an eye on other competitors and wind evolution can save your race. Imagine you had a good start and an amazing speed compared to the group above or below you, but the guys on the other side got a gust that you missed and suddenly 30 boats pass in front in the next crossing…disaster! Preventing this situation comes by watching what’s happening around. Youssef Akrout is a two time Olympian, a physiotherapist, an athletic trainer, a sailing coach, and a founder of Dream Big Sailing, which provides multiple services for dinghy sailors as a sailing academy.